Like you, everyone is on an incredible life’s journey. It’s a great adventure of discovery, to realize dreams, to reach goals, and to contribute. Besides growth and successes, the journey is also filled with uncertainties, challenges, trials, blocks. Life is about accepting these waves, discovering who you are and experiencing that. And you can be a leader of your own life? I created the Hero’s Journey 10 Day Retreat to support you in discovering and unlocking the hero(ine) within you. To remember who you are. To be present. To find clarity. To enhance your leadership skills. In this retreat I’ll share my life’s experiences, wisdom, knowledge, and all what I’ve learnt about The Hero’s Journey. The course is based on the insights of Joseph Campbell, The Double Healix model, and many more inspiring and powerful teachings. At this retreat, I will hold the sacred space where you feel safe and seen, and where you can explore, learn, release, grow, and be yourself. I look forward to meet you in person here in Vilcabamba—The Valley of Longevity. Thank you, Kim Ho for such an amazing and thought provoking introduction to the Hero's Journey. And, what a beautiful setting you, Fleur, and your children provided to encourage me to explore my personal journey. As a result, I was able to recognize and appreciate my previous journeys and achievements. Furthermore, I have become motivated to stay on an upward continuum as I start my new journey here in Ecuador. I certainly recommend working with you, Kim Ho. You are an inspirational and caring leader. Thank you for your presence, wisdom, and extended support. Are you a CEO, leader, or manager who desires to lead with more vision, depth, and authenticity? Are you a soulfilled person who wants to discover more meaning and purpose in life? Learn more about The Hero’s Journey and work with me personally in the 10 Day Hero’s Journey Retreat in amazing Vilcabamba—The Valley of Longevity. Immerse yourself in the incredible lush nature, surrounded by the majestic Andean mountains, and the pristine Capa Maco river, and deepen your teachings. Nature walks, the tranquility of our land, and the energizing river are some of the great features of the valley I’m living in. Imagine being here and absorbing the powerful essence of nature in order to get more present, empowered, and highly inspired. This is a unique opportunity to dive deeper into your personal growth and to embrace the hero(ine) within you with full surrender. Spending 10 days here will be a transformational experience. The 10 Day Retreat is for you if you want to grow and enhance your leadership skills through the 12 universal steps of The Hero’s Journey. I will teach you how to start recognizing these 12 phases in your daily life. And I’ll show you how to integrate The Hero’s Journey in your business and life so that you can have a thriving life with meaning and purpose. You’ll gain more clarity, confidence, and focus for your business and life. I will also show you the power of storytelling and how you can use this to attract more abundance and success. Spaces are limited because I want to be of full service to my students in this deep process of growth and learning. I have 6 spots available. • 9 night stay on our land—simple accomodation in one of our comfortable guesthouses. Participants will share a casita. • All vegetarian meals—breakfast, lunch & light dinner—healthy snacks, raw organic chocolate, drinks, and super smoothies. Start: Sunday August 4th, 10:00 am—Tuesday August 13th 2019, 12:00 noon. Place: my home in the Capa Maco Valley, Vilcabamba, Ecuador. If you’d like to apply, you’re invited to fill out an application form (‘Apply Now’ buttons below). Spaces are limited because I want to be of full service to my students in this deep process of growth and learning. I have only 6 spots available. who are ready to take the next step in their lives. After the Private Intensive with Kim Ho I felt so happy and invigorated because the tai chi, The Hero’s Journey, and the moments with his family were so inspiring. What I learnt is to enjoy life in the little moments, to smile more, and not to overthink things—to stay present. It was fantastic to work with Kim Ho! He was there for me all the time. I could feel his positive energy and dedication to help me improve my life. Vilcabamba lies at an average altitude of 1600 meters in the Loja province, South Ecuador. It is surrounded by the Andean mountains and has a subtropical climate. This means all year around spring with a dry and wet season. The average temerature is about 23-28 degrees Celsius during the day and cooler in the evening. Because of its unique climate, the nature is abundant green and has the optimal properties to grow fruits and vegetables. The air is very pure and clean here. The population is around 5000 inhabitants with a substantial expat community. The name is derived from a local tree named Huilco. In the old days of Inca reign, it is said Vilcabamba was a refuge for Inca tribes to rest and rejuvenate. The legend tells that the people are getting very old here due to the perfect living circumstances. Therefore, Vilcabamba is known as ‘The Valley of Longevity’. During The Hero’s Journey Retreat I’ll be available for you, when you have questions, or need support. We’ll come together in a live call before the retreat starts so that we can meet up and address any questions, needs or concerns. I’ll gift the participants an aftercare live call after the retreat to support them in the process of integrating the lessons and experiences in their daily lives. We’ll let the flow of the 10 day retreat determine what surprises come to us. At the end of your Hero’s Journey Retreat, you’ll receive a certificate of completion. This will validate your commitment and energy you have put in your work, and the lessons received by me during the 10 days. are part of the program too. The exchange for this 10 Day Retreat is $1895. Payment plan—2 or 4 payments—is available. In 2011 my family and I answered the call to move to Vilcabamba. I’m currently living here on my lush land with fruit trees, colorful birds, bees, organic vegetables, and next to a pristine river. With more than 10 years experience, I have deepened my knowledge on The Hero’s Journey with my own life’s events and other mentors—Mother nature is chief among them. Do I need any preparation or read any books before I start the retreat? The only thing I invite you to bring is an open heart, mind, and a curiosity to learn new things. The program will unfold naturally and I’ll teach you the important insights of The Hero’s Journey. I might give you some recommendations for reading. What is the best way to travel to Vilcabamba, Ecuador? The best way to travel to Ecuador is by plane with destination Quito or Guayaquil. From either city, you can take a domestic flight to Catamayo airport (45 minutes), which is near Loja. From here you can take a taxi or bus to Vilcabamba. This will take 1.5 hrs by taxi and 2.5 hrs by bus to reach Vilcabamba. If you’d like a pick up from Catamayo, I can arrange this (cost $40-$45). By bus you need to go through Loja bus terminal and switch bus here. By bus is the cheapest option. Another option would be the night bus from Quito or Guayaquil to Loja bus terminal and from here the bus to Vilcabamba. Expect travel times of 8-11 hrs. Kim Ho Leung will teach all live classes. Fleur Royale, his soul partner, will chime in regularly to share a visualisation or mediation. For support you can contact me anytime. If you have questions, concerns, or want to share aha’s and wins, I’ll be there for you. The support goes through email and WhatsApp. Furthermore, there’ll be support from your fellow students during the retreat..
What’s the weather like in Vilcabamba? What clothes should I bring? 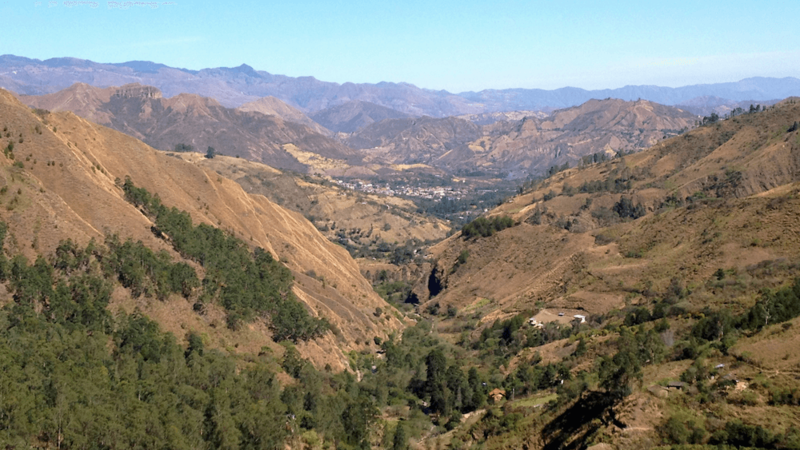 Vilcabamba has a subtropical climate, which means all year around spring with a dry and wet season. August is in the dry season with lots of sun and an average temperature of 25-28 degrees Celsius during the day and cooler in the evening. The best way to dress is to layer your clothes: t-shirts, long sleeves, warm sweaters, shorts, pants, sandals, flip-flops, and sturdy hiking shoes. Also, bring your swimwear. Is it safe to go around in Vilcabamba (and Ecuador)? We’ve been living in Vilcabamba for 7 years and we experience it as a very safe and comfortable place. We know our neighbours and they know us. We also use only trustworthy taxi drivers. But, in general the local Ecuadorians are very friendly and social. They really appreciate visitors who speak or try to speak Spanish with them. As a conscious traveller, you should take your responsibility regarding your luggage and personal belongings during your travels. If I leave the retreat early, because it’s not a fit, what happens? If you’d decide to leave during the retreat, you’ll stay responsible for the full payment for the program. I hold this policy to keep the program financially viable as I’ll be unable to replace your spot with another participant. Do you offer a payment plan for the retreat? Yes, I do. You can pay the full fee in one payment, 2 payments, or 4 payments. If you’d pay in 2 or 4 payments, there will be additional costs. In the price are included: 10 days of live training, 9 night stay at our land, all meals—breakfast, lunch and light dinner, healthy snacks, personal journal, all trips, personal mentoring & support, surprise activities, and many more. Kim Ho inspired me very much with his extensive movie knowledge, the way he applied movie clips to the leadership content, and how he performed before the audience. Later, I was lucky to work with him. I was able to experience directly how he adopts the theme, finds the right tools to support the message and blends all in order to inspire the participants. I’m grateful to Kim Ho what he’s taught me, both about leadership and myself."